Converts pop bottle into a handy fountain. Made of durable cast aluminum. 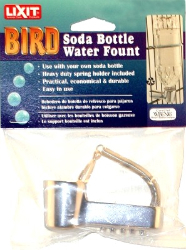 Be slipped into cage bars to hold a 12 to 16 oz soda bottle for economical watering. For birds & small animals: canaries, parakeets, cockatiels, rabbits, guinea, pigs, hamsters, mice, rats, and other animals. Not recommended for large parrots.